What if she snores during nap time? What if the other kids count and color better than she can? What if no one plays with her? 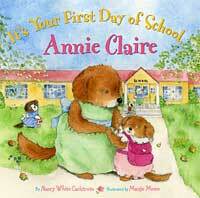 Perfect for every child who is about to start school and needs some reassurance about the changes to come, the cheerful text and soothing illustrations in It’s Your First Day of School, Annie Claire will calm fears and build excitement for the special new year ahead. Yes it is, my dear.